Each year our school incorporates a school-wide theme at the beginning of the year. The theme is always the inspiration that we use to decorate our hallways and create fun activities for the beginning of the school year. This year, our school-wide theme is Superheroes. For me this is such an appropriate theme this year because I could use a few superpowers to help with the changes that are taking place for me. I am moving up to 5th grade this year, and although I have been in 5th before, it has been a long time. Even though it will be a lot of work, I am looking forward to a super year! There are so many fun ways to incorporate this school-wide Superhero theme into our first day and first week activities. Be sure to read the entire article for some free and easy activity ideas for activities for a Superhero theme back to school year. The Superhero First Day Activities packet is filled with some easy print-and-go activities that your students will love! 10 fun hero themed activities are included in this back to school packet. Activities included range from get-to-know-you activities to art activities that can be displayed in the hallways. The fun activity pictured above is included in this packet. Students draw and write about themselves to create this adorable and fun display. This is perfect for your hallways or bulletin boards. Just click the link above for a link to the packet. What better way to get to know your students on the first day of school than with the All About Me Posters? This Superhero All About Me Packet is a perfect way to incorporate a hero theme in your first day activities. My students love completing these posters, sharing them, and seeing them displayed in the hallway. Use these for the first day of school, birthdays, student VIP's, and more! Find them in my store. One simple way to incorporate a superhero theme throughout your entire school year is to use these Superhero Motivational Posters. Not only are these posters bright, fun, and colorful, but they also provide students with a reminder of goals to work toward during this school year. Display these on a wall or on a bulletin board. Use them each day to help teach students positive classroom behavior. You and your students will love these Superhero Posters found in my store. Here are some fun and free ideas that fit in perfectly with a superhero theme! Post 4-5 pictures of recognizable Superheroes around the room. Tell students that they are going to pick a Superhero picture to stand next to. They need to think about which Superhero's qualities best relate to them and describe the goals that they would like to reach this year. Once the students move to the Superhero of their choice, give each group a sticky note and assign a writer. Students will write down how their goals relate to this Superhero. Then share. This activity requires some deep thinking and is probably best for upper grades. My 5th graders loved this, and they came up with some wonderful ideas such as, "We want to be like this superhero because we want to fly high with our grades this year." "We want to be like this superhero and be a strong reader." This activity is a fun way to get the students up and moving, working with others in the classroom, and get them thinking. Divide your class into groups of 4-5 students. Give each student a large sheet of paper, glue, scissors, markers, and an assortment of printed superhero pictures and symbols. Instruct students to create a Superhero collage that represents them and this new school year. Students might even think of a Superhero classroom name and place it at the top of the page. After all groups have finished with their collages, students may share with the entire class. Give each student a Venn diagram. Instruct students to label one side with their name and the other side with a famous superhero of their choice. Students will use the Venn diagram to write about differences between themselves and this superhero. Then they will write about similarities between themselves and the superhero in the center. For example, a student might be like a particular superhero because they both like to do nice things for other people. Pass out index cards. Instruct students to write his/her name at the top. Then tell students to each list 2 facts about themselves that they would like to share with the class. Finally, have students name the superhero they are most like and why. Take cards up. Read each card aloud and allow other students to guess who wrote it. This is a fun ice breaker that the students love. Another option is instead of reading all of the cards at once, share them throughout the day or even the first week. Thanks for stopping by! I hope you have a blessed day and a super year! With the beginning of school just around the corner (or here for many of you), it is that time of year that teachers are readying their lesson plans and searching for ideas and activities. Having a list of go-to resources for the entire year can help make planning a breeze. I wanted to share a go-to resource and a freebie for reading, language, and writing that will make your lesson planning a little easier while fulfilling some of your standard requirements. 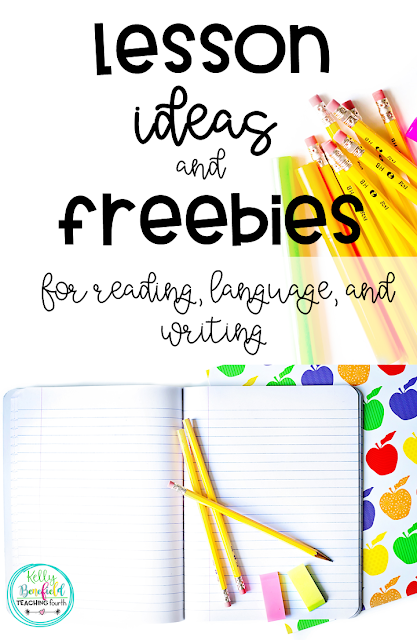 Be sure to download each of the freebies! My go-to resource for reading would have to be my graphic organizers. 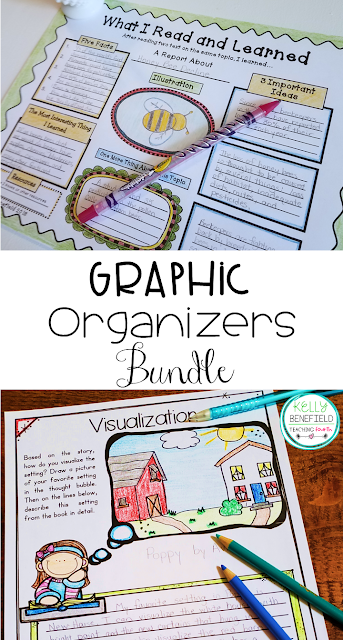 Having this resource at hand not only helps make my lesson planning easier, but more importantly, these graphic organizers are extremely beneficial to the students. This set of graphic organizers is aligned with the common core standards, plus they work with almost any book or passage. This bundle is a great resource to add to your collection of reading resources. Not only will you love them, but your students will as well. Two sets are included in the bundle: one for reading literature and one for informational texts. Just look at what buyers have said. Then click on the picture below to check it out in my store. "LOVE, LOVE, LOVE! Worth every penny!! 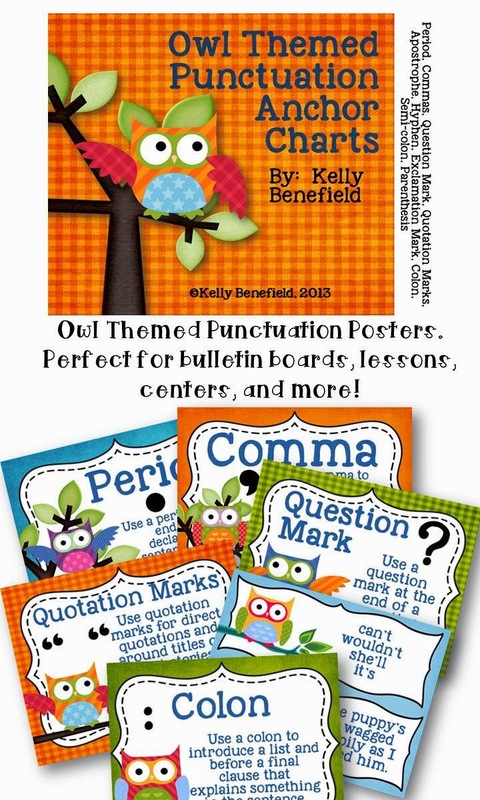 These are so well-done and made to hit every common core skill in reading . . . saves me so much time! Thanks for creating and sharing these!" "The thoughtfulness in every page is amazing! I love the creativity in each page. This is a no prep, easy way to engage students as they are reading. Such a time-saver and definitely worth what I paid. LOVE this product. Highly recommend because there are a variety of sheets available! It definitely made my life easier not having to search various places for all of these pages! " "Still use this three years later- what a great purchase." You can find a free set of graphic organizer to use with your students here. Simply click the picture below for the link. My favorite go-to resource for writing is my Month by Month Writing Prompts, Posters, and Graphic Organizers. You will have an entire year's worth of fun writing prompts inspired by traditional as well as unusual and offbeat holidays that your students will love. The graphic organizers are perfect for helping your students learn to plan and organize their writing. 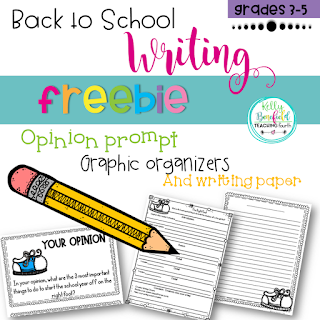 Grab my free back to school writing prompt and graphic organizer. This is a perfect writing assignment to use during the first week of school. Finally, if you are looking for a fun language/grammar packet to use this entire school year, then this one is perfect! 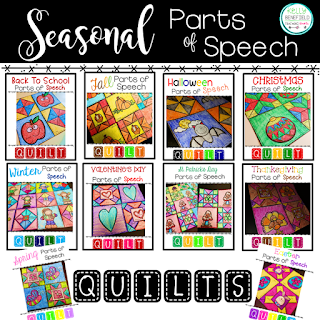 Your students will absolutely love coloring these seasonal parts of speech quilt pieces. This is not only a fun way to review the parts of speech, but it also makes a very pretty display for your bulletin board or hallway. 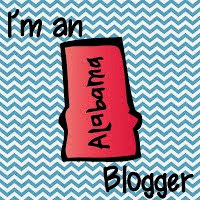 Be sure to download this fun quilts freebie. It contains an apple themed quilt, pineapple, school bus, and more. This is another great first week activity. Have a blessed day, and enjoy these freebies! You have decorated, straightened and organized your room, arranged desk, labeled books and bins, but now the first day of school is just around the corner, and you realize that you have no idea what you are going to do! 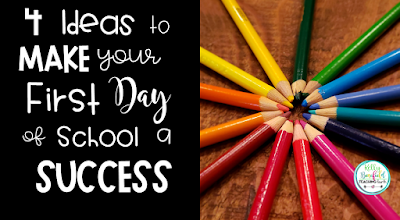 The first day of school can be a day full of excitement and nerves, even for teachers, but here are a few ideas to help make this day a success whether this is your first year of teaching, or whether you have been teaching for 25+ years like myself. Whatever you plan to do on the first day, it is vital that you are well prepared. 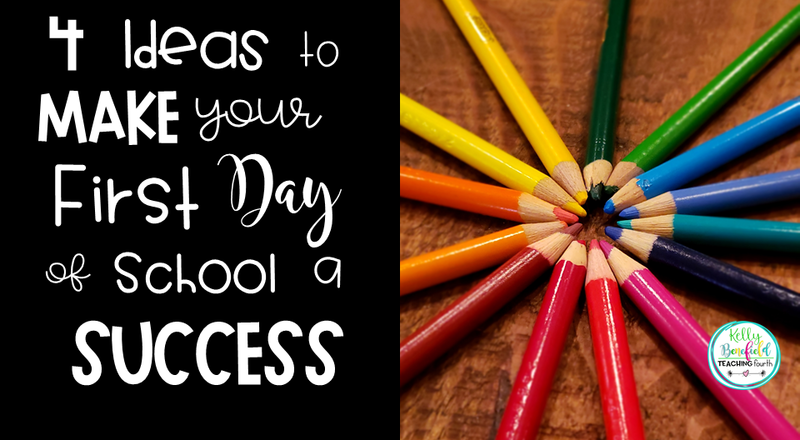 Have every detail of the day planned out along with all supplies, worksheets, and activities at hand. Have backup plans for those unexpected delays or events because, believe me, unexpected will happen. Prepare extra copies of everything for new students. Have supplies, parent letters, and seating area ready for these students so that they will feel welcomed and you will feel calm and prepared. If no new student shows up on the first day, chances are that you may need these items later in the year. Plan more than you can do on the first day of school. It is better to be over prepared than under prepared. I begin with the most important items first, and work down to the least important. Any activities that we do not have time to complete, go into a sub tub for my substitute for later in the year. The worst thing to do on the first day is to run out of ideas and activities and have a classroom full of students staring at you waiting for instructions. Having something prepared and ready for students to do as they come to the classroom will help get your first day started off great. Placing copies of activities on students' desks gives students something to do as you greet your students, take up lunch money, take up forms, etc. All About Me Posters are a perfect activity for this. Check out my large selection of All About Me Posters. A successful year can often be attributed to time spent practicing classroom procedures and addressing classroom expectations. Begin the first day by modeling classroom routines to help your students clearly understand your expectations. Practicing procedures is not time wasted, rather, it is time very well spent. Model your expectations for routines such getting into groups, passing out books or workbooks, lining up, etc. You'll be amazed at the difference this can make in your school year. I certainly hope your first day of school is a very blessed one!